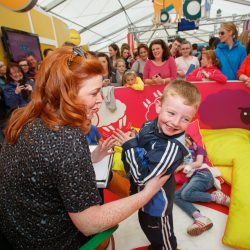 Some 124,500 attended day 2 of the National Ploughing Championships which kicked off with the arrival of The Minister for Agriculture, Food and the Marine, Simon Coveney who put a lot of emphasis on farm safety, launching the Embrace Farm videos on farm safety and the ESB’s guidelines on farming safely with electricity. 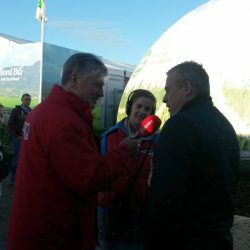 The sun shone on the probable record crowd as thousands teamed into the 800 acre site from the four corners of Ireland. The 124,500 crowd was well up on the numbers for day two last year, which was 90,000. One bus load of children had a lucky escape on their journey to Ratheniska as the bus on which they were travelling caught fire. Thankfully all escaped unscathed. New elected Vice President of the European Parliament was also in attendance to and was keen to highlight that party colleague Phil Hogan will make a very good EU farm Commissioner and is already being warmly received in EU circles. Other political luminaries in attendance included Fianna Fail leader Michael Martin and Tainiste Joan Burton. Pat Kenny gets out and about early to meet and greet. 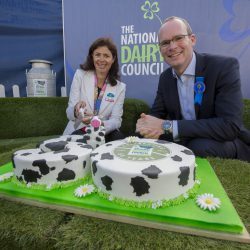 Happy Birthday to the NDC! Blathnaid Ni Chofaigh making friends. 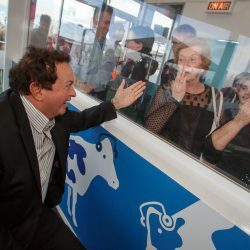 Marty Morrissey with some of his fans! 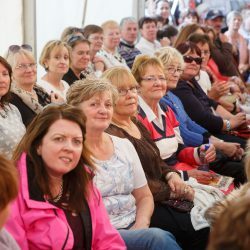 Crowds at the fashion show during the day.